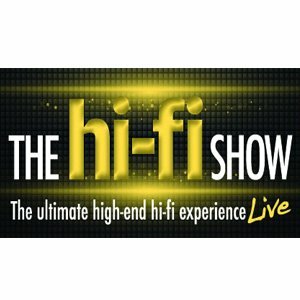 This is the first time Linette and I have visited the National Audio Show at Whittlebury, but after speaking at length with Roy Bird of the Chester Group we decided that this was certainly one of the shows that needed to be on our calendar this year. 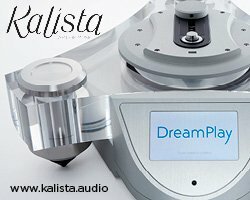 For those of you who have not attended National Audio Show before then I strongly suggest you do. The venue is a huge country hotel that has a golf course, spa and loads more going on. It’s situated a stone’s throw from Silverstone and when you’re outside the venue you can hear the cars – it was the British Touring Cars doing their stuff the weekend of the show. Being such a massive place there’s loads of other stuff going on and we were sharing the venue with a wedding or two and lots of golfists. 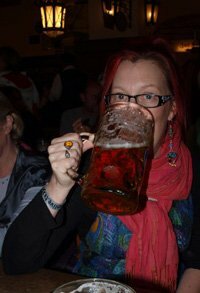 One of the weirder things was being sat in the bar with folk wandering around in dressing gowns – we assume these were people mid spa pamper rather than trying to make some-kind of fashion statement. Whilst not heaving with people, the show was busy and there were a good number of couples in attendance which was good to see. After a bit of a wander round to get a feel for what was going on and to get our bearings we started going into each of the rooms to take a look and listen to what the exhibitors had to offer. 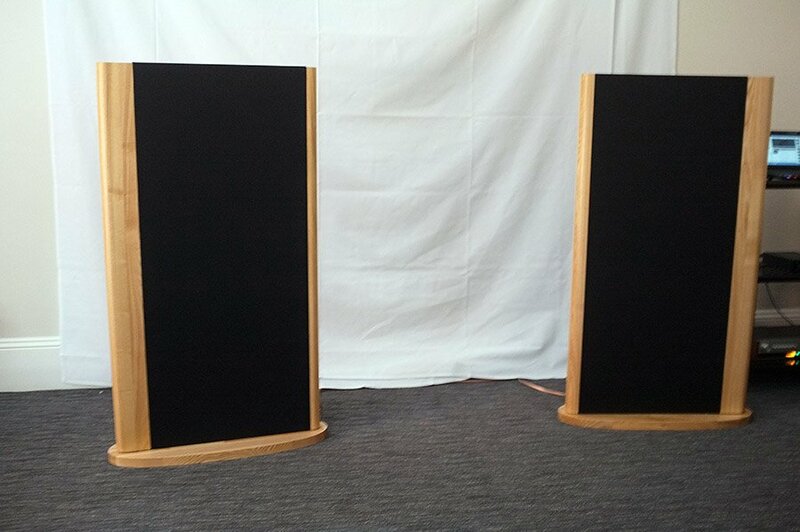 Vivid Audio had taken a large room at the show and were demoing their Giya G2s when we were in the room. Amplifier etc came in the form of a Devialet LE 1000. I’ve never not been impressed with the sound that Vivid manage to produce at shows and have really enjoyed them at Munich in the past. 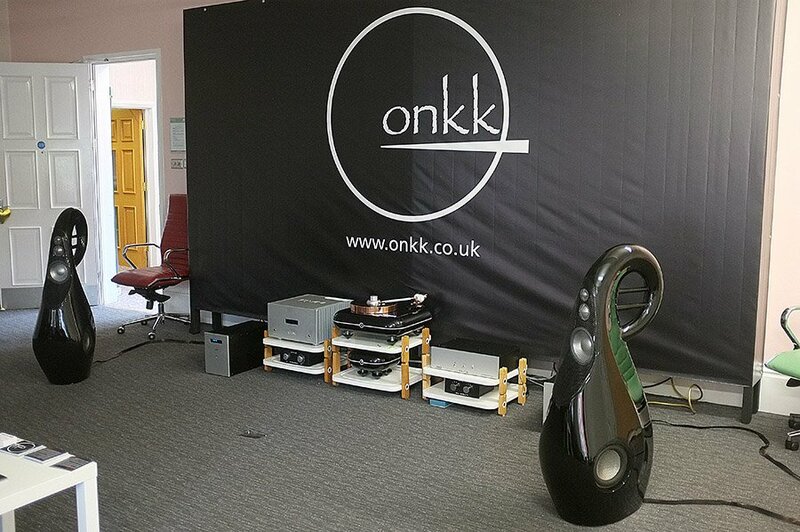 We managed to have a word with the main man behind the unusually shaped Vivid range of speakers, Laurence Dickie, as well as Jake Purches and Arif Huseyin from the company too, and all seemed very pleased with the sound in the room. 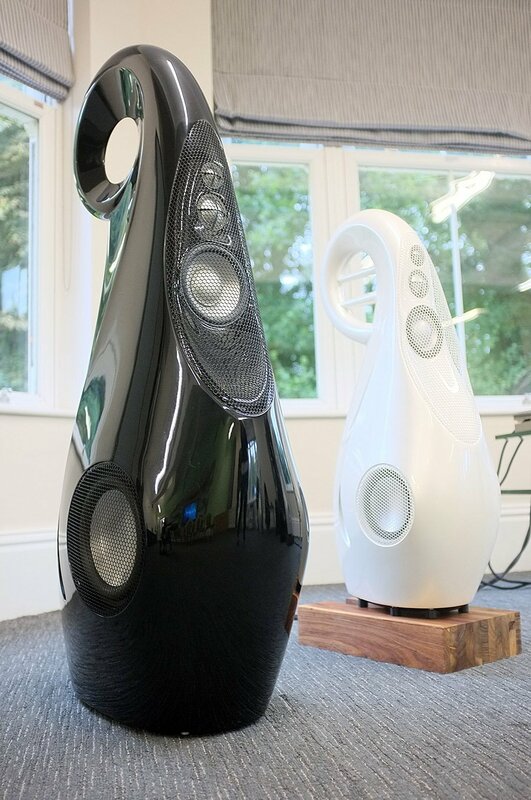 Also on show were the smaller, and somewhat more conventionally looking loudspeakers, the B1 Decades which our very own Janine reviewed only very recently as well as a pair of G1s. This was an exceptionally good sounding room that just oozed high-end quality from every pore, as well as being visually stunning. 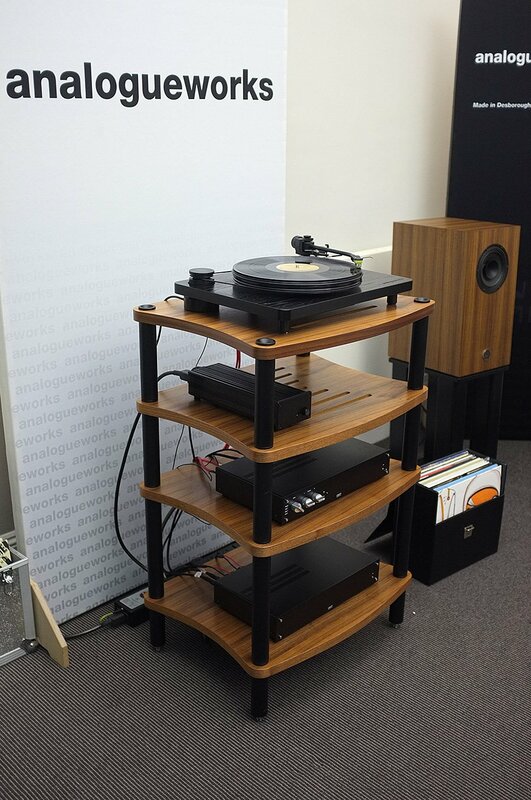 The centrepiece to the whole caboodle was the stunning vinyl replay system composed of the Clearaudio Master Innovation with a DS Audio Master 1 optical cartridge with its dedicated phonostage. 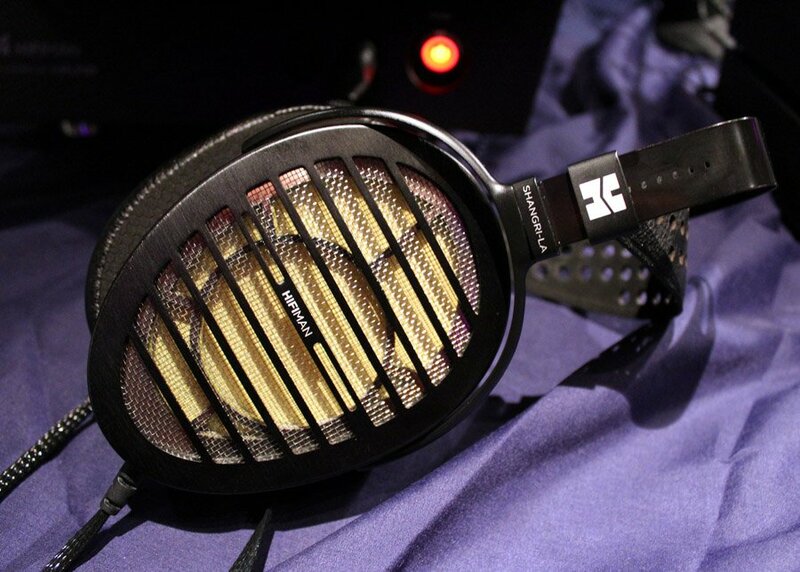 This thing tracks brilliantly and with the Furutech SK Filter in place there wasn’t a hint of static. Pre amp was in the form of the Gamu T D3i feeding the Danish company’s D200i stereo power amplifier, which in turn powered a pair of their RS7i loudspeakers. Isotek Super Titans dealt with any nasties in the power supply, bringing the whole lot together and offering up a really, really lovely sounding system. Other, and more affordable, Clearaudio turntables were on show of course and hats of to Chris and Alex for putting together a room that was relaxed and chilled out, but also for playing real world music rather than the plinky plonky jazz favoured by some at shows. 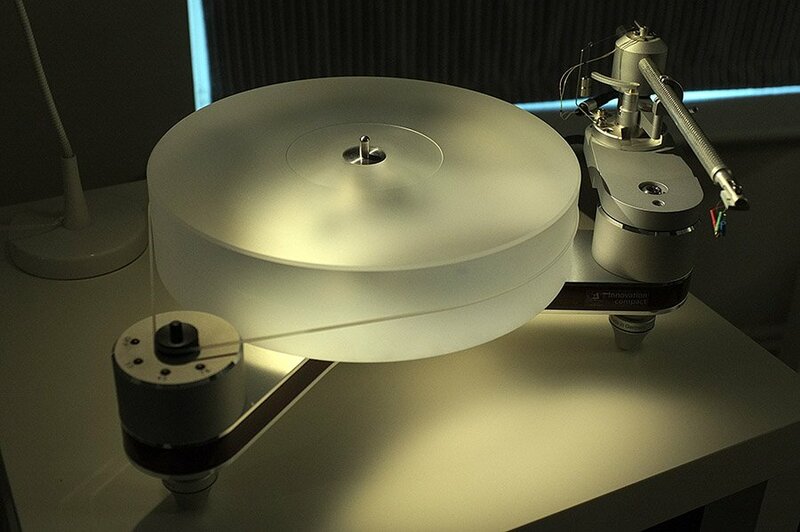 The Onkk Cue turntable is the brainchild of Paul Beckett and really is a sight to behold. It’s a direct drive and highly engineered bit of kit that today came fitted with an Origin Live Conqueror arm and Van den Hul Colibri cartridge. 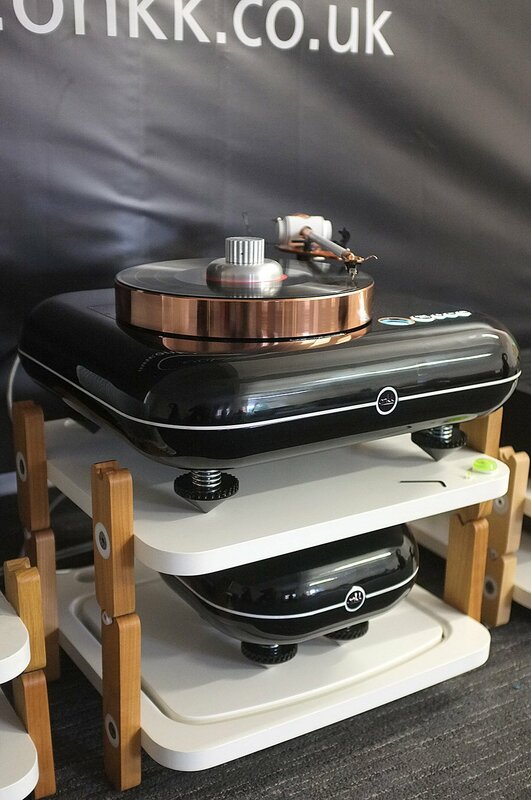 Accompanying the turntable was the NVO SPA2 phono stage that sports no less than 21 valves and the Music First Baby Reference 1 preamplifier, all feeding the Giya loudspeakers from Vivid Audio. 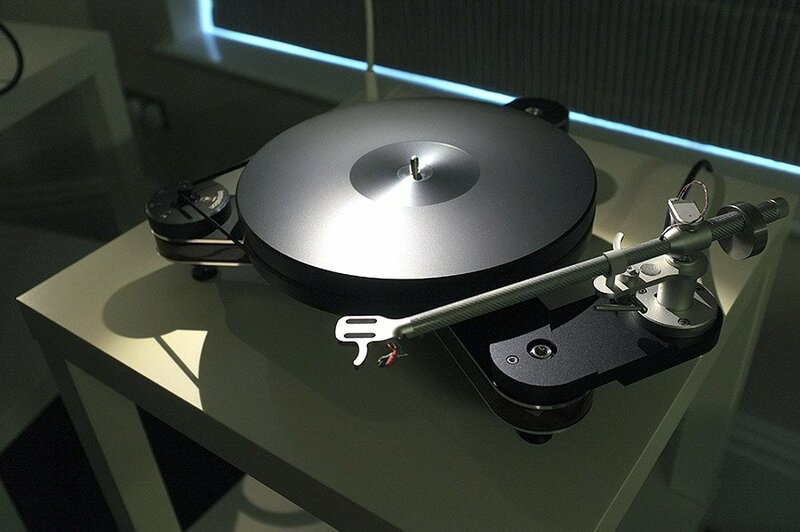 Paul is highly passionate about his creation and, whilst this esoteric turntable could possibly command a stratospheric price tag, he is adamant that it will retail without and arm and cartridge for around £16K when it is finally in production in mid-November. 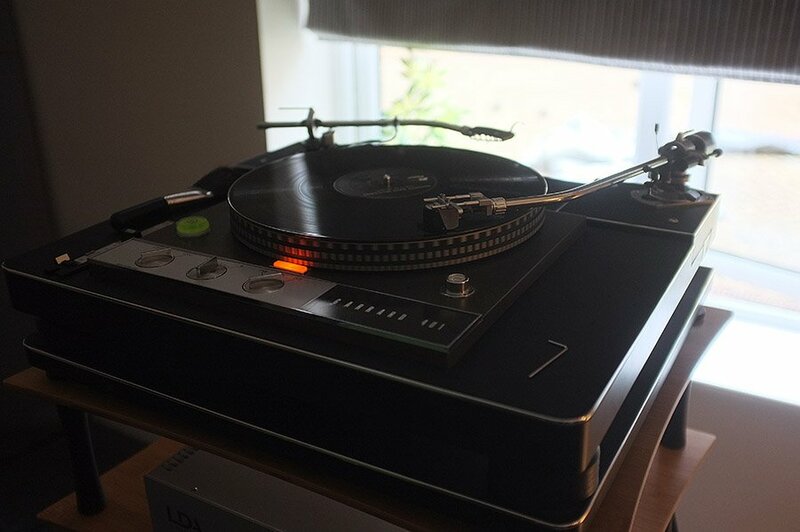 The boys from Divine Audio were making some rather pleasant sounds in their room using the Analogue Works Zero turntable (which we use a higher level model here at Hifi Pig Towers) along with a Jelco SA-750EB tonearm and NAgaoka MP150 MM cartridge. Most interesting were the speakers in the room that sounded really rather pleasant indeed. These were the Omega Speaker Systems single driver speakers that have a sensitivity of 95dB and as Tim Chorlton described them are a “Fred in a shed” design. 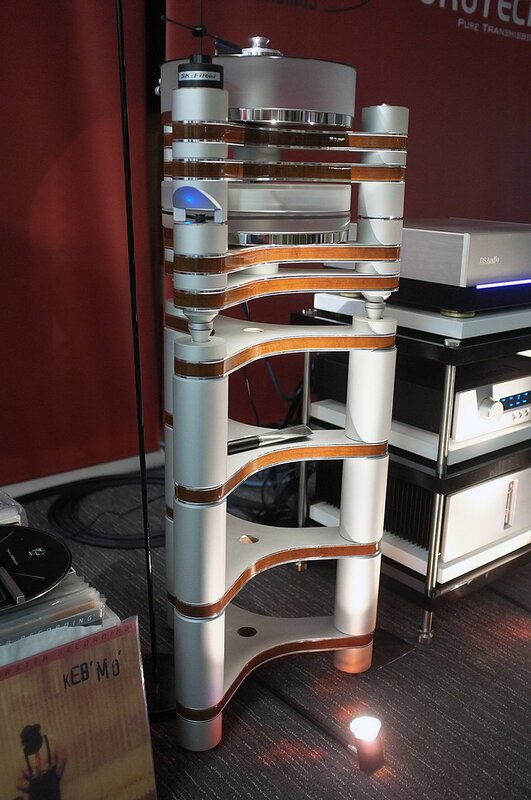 The £2000 speakers use a super alnico driver and are hand built in Norwalk, Conneticut, not by Fred, but by a chap called Louis Chochos Preamplifier and power amplifier were from Croft. 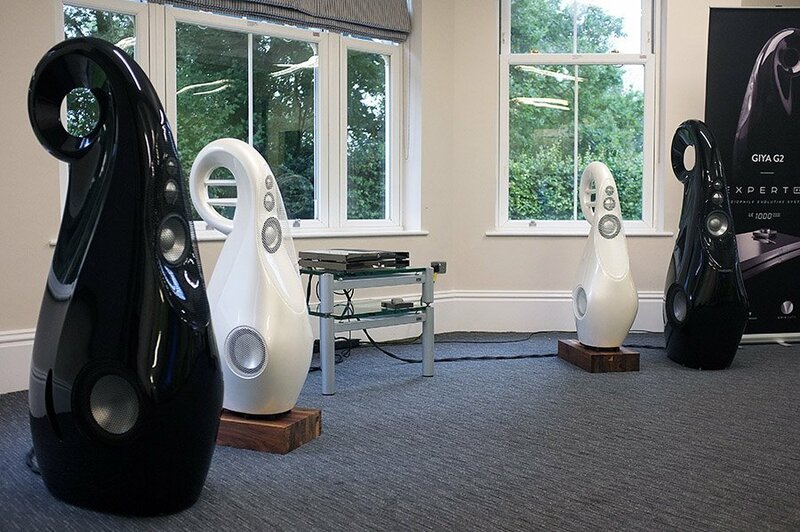 Zouch Audio are a retailer based in Ashby-de-la-Zouch, Leicestershire and stock a great range of brands but at National Audio Show 2016 they chose to use Luxman electronics partnered with Dali loudspeakers. 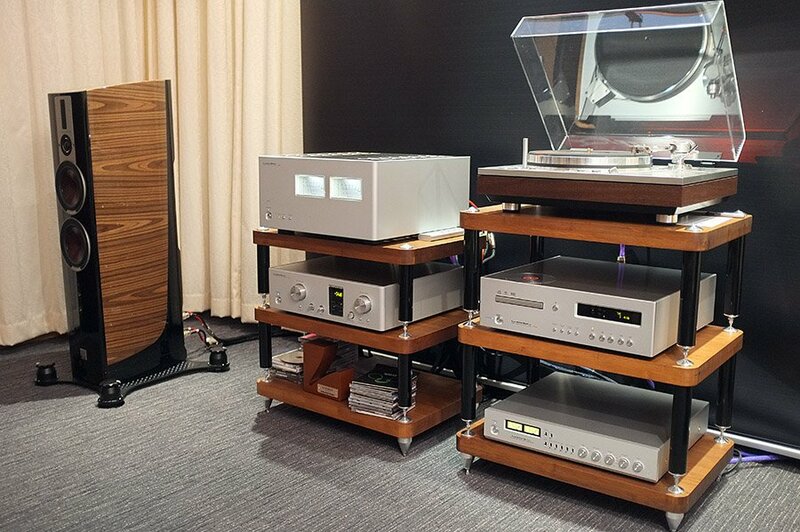 The power amp was the Luxman M 700u, preamp was the C 700u, CD player was the D-06u, whilst the Dali speakers used on the day were the Epicon 6 model sat on top of Townshend Audio’s isolation platforms. Now here was something completely different and totally unexpected. Wall Of Music are based in Northern Ireland but are actually Lithuanian in origin and designed by Audris Saklys. 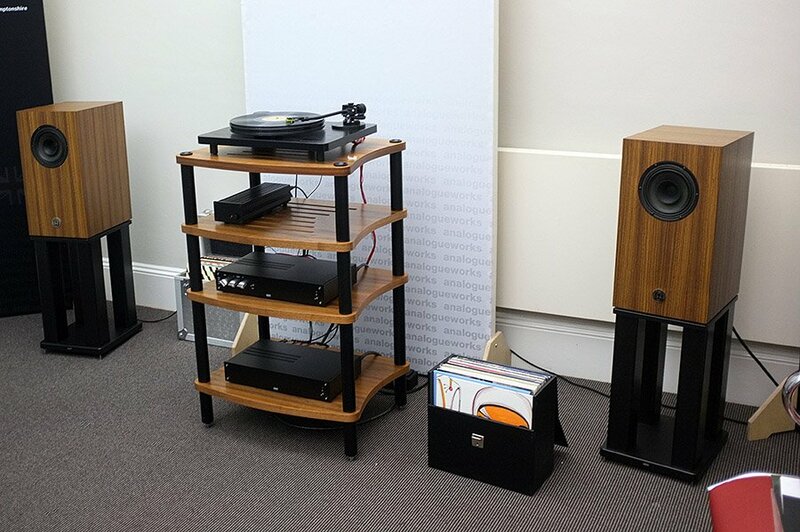 The £3700 Prelude loudspeakers were positioned very closely together and powered by a VERY modest power amplifier. Speaking to Audris he says that the speakers are “designed for people who like music and not sound” and claims they will reproduce music perfectly happily from YouTube or any other source. 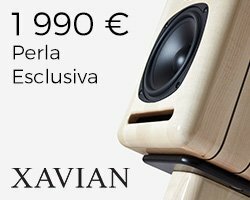 The speakers are an unusual design and you’d be forgiven for thinking they were an electrostatic design at first glance but each speaker has 16 bass drivers, each 16cm wide but with a very light diaphragm weighing in at just 2.5g. 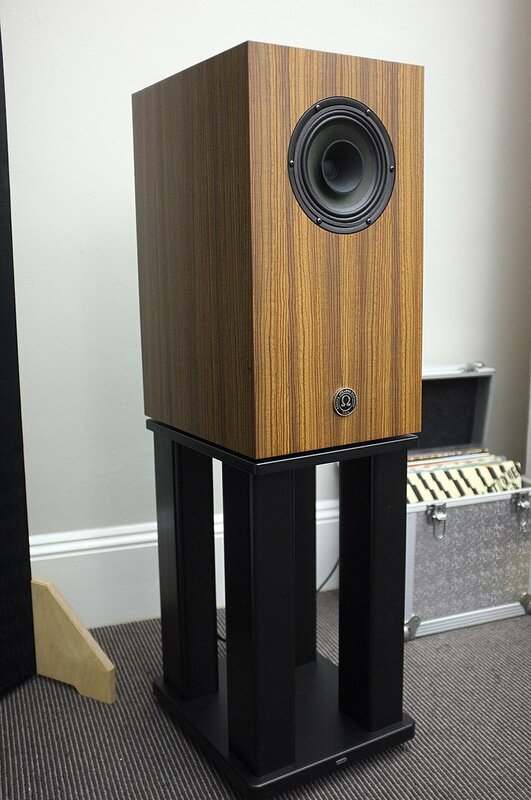 These speakers were really rather lovely to hear despite the humble electronics before them. Xlusive AV are a retailer based on the South coast at Hastings. 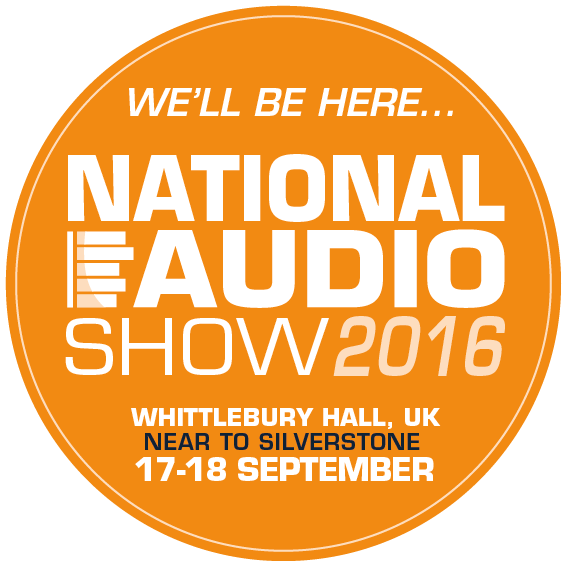 At National Audio Show 2016 they were highlighting the range of loudspeakers from French manufacturer Waterfall. 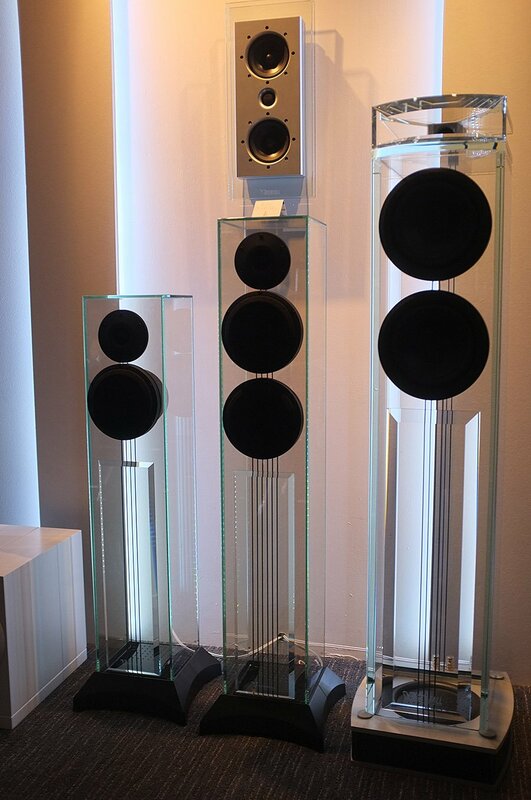 Now these are an interesting range of floorstanding speakers that are made of glass. They look absolutely stunning and we’ve heard them many, many times in the past. Today they were powered by Roksan electronics and a Marantz CD player. 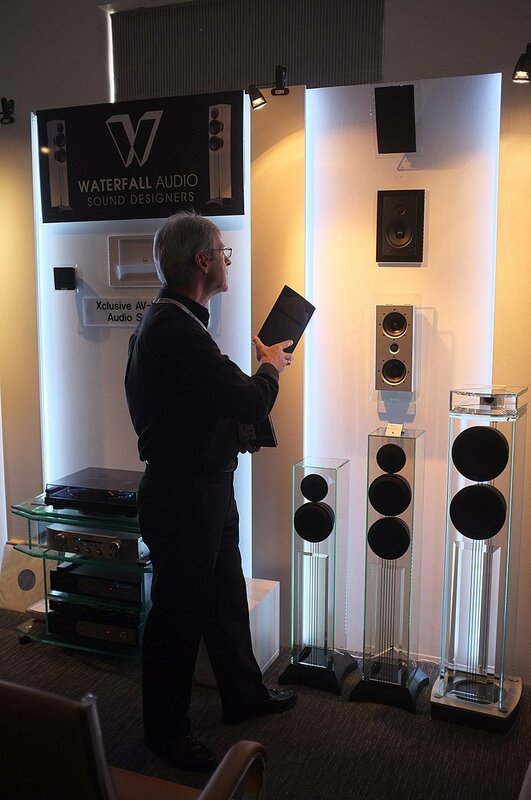 Waterfall also produces the Hurricane Evo in-wall loudspeaker that xlusive say are proving to be very popular indeed. 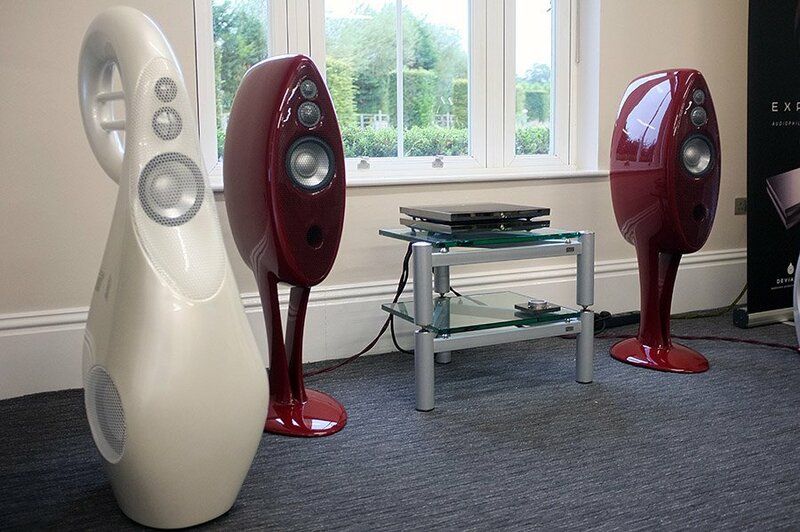 Concerto Audio are a retailer based in Clayhall, Essex. They stock a wide range of gear and today had founder and CEO of Analog Domain, Angel Despotov with them. 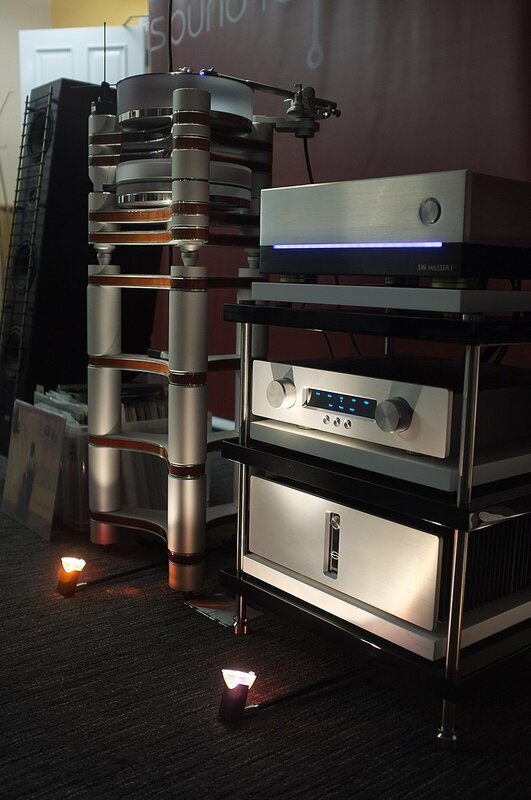 Of course the preamplifier and power amplifier were from Analog Domain in the form of the Isis pairing, but also on show were the Formula DAC from Aequa and their La Diva transport. 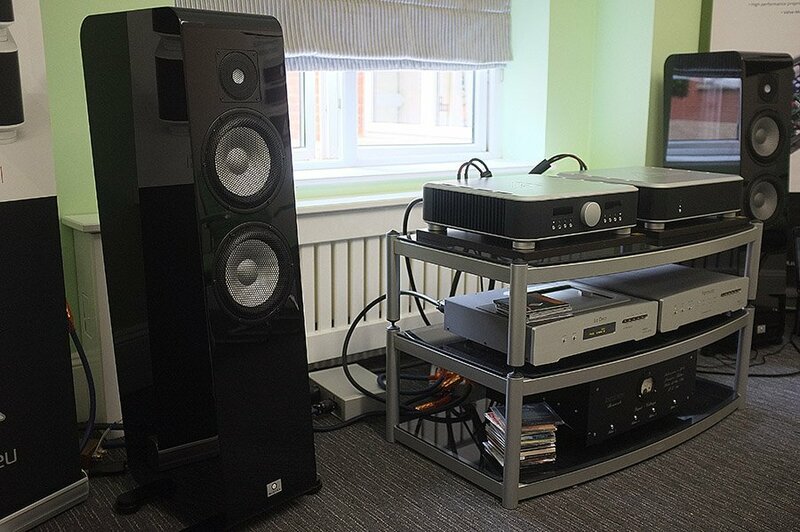 Speakers were from Swedish company Marten in the guise of their Django Ls. 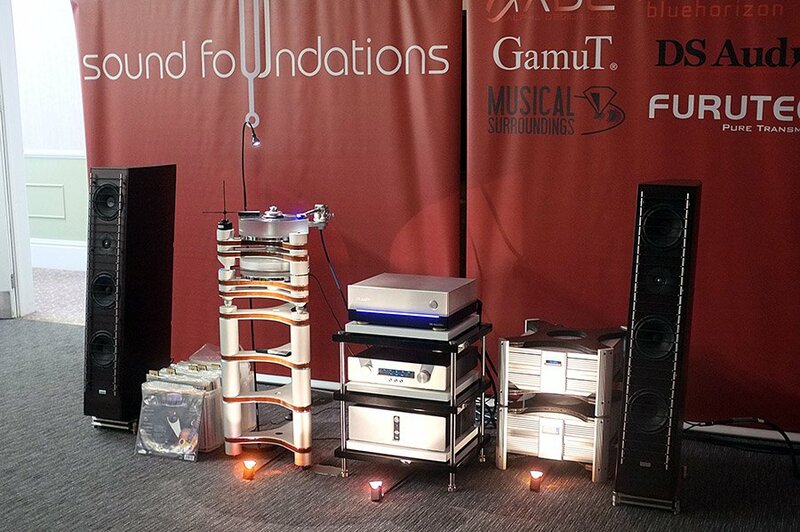 All in all a very high-end system that sounded very nice on the day. 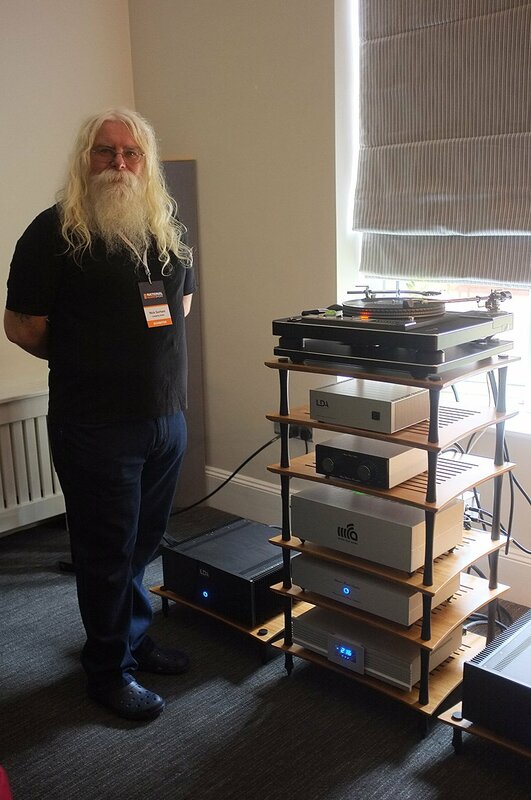 Longdog Audio are based in rural Halifax in West Yorkshire and is owned and run by the splendidly bearded Nick Goreham. 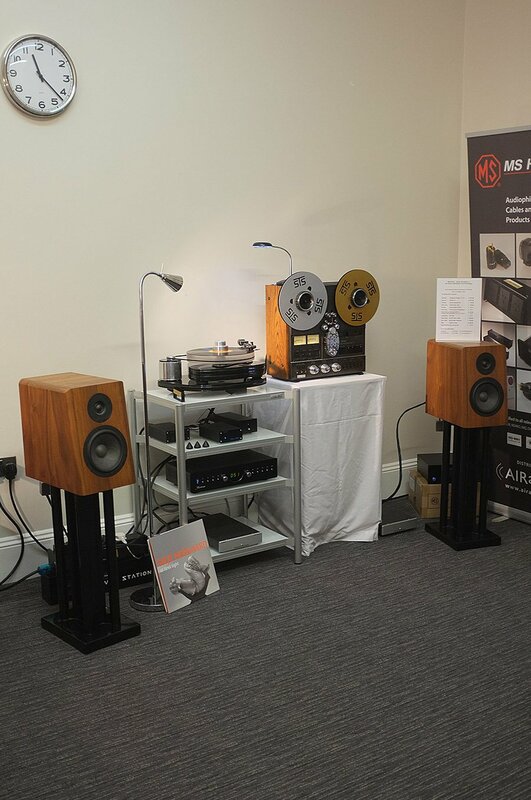 Apart from the loudspeakers that were Harbeth, the preamplifier and phonostage that was from Music First and the Garrard turntable, the rest of this system was made by Longdog Audio and rather splendid it was too, having a retail price of around £35 000. 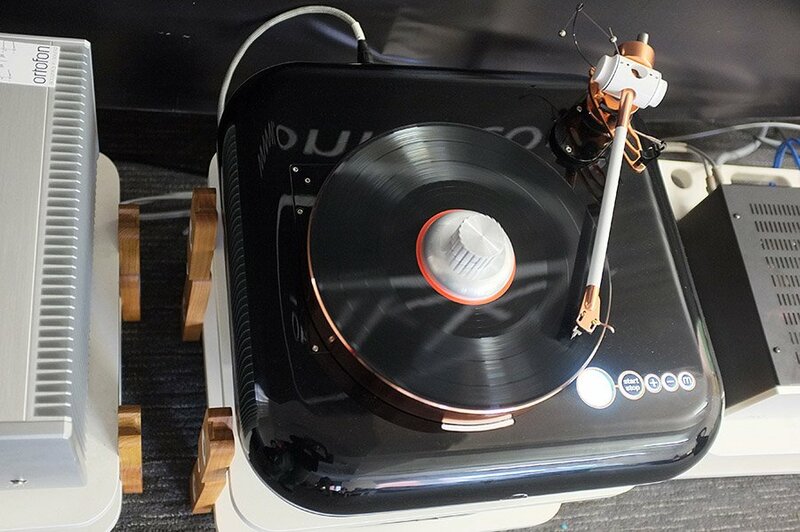 The highlight of this room was a demonstration of the company’s Audio Quartz Regenerator that is made especially for idler wheel turntables just like the 401 they were using today. For the AB dem the guys from Longdog plugged the turntable directly into the mains without the supply in place and then added the new regenerator. Now I’m a little sceptical about all these things and only really believe (or otherwise) the hype of products after having heard the item in question. This was a bit of an eye opener if I’m absolutely honest and there was a very obvious and somewhat gobsmacking change in the sound once the unit was inline; there was simply more weight and authority to the music being played. If you have an idler wheel turntable then you really do need to get yourself along to an audition of this! 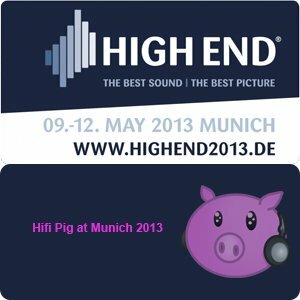 Air Audio is a UK based distributor headed up by Michael Osborn. 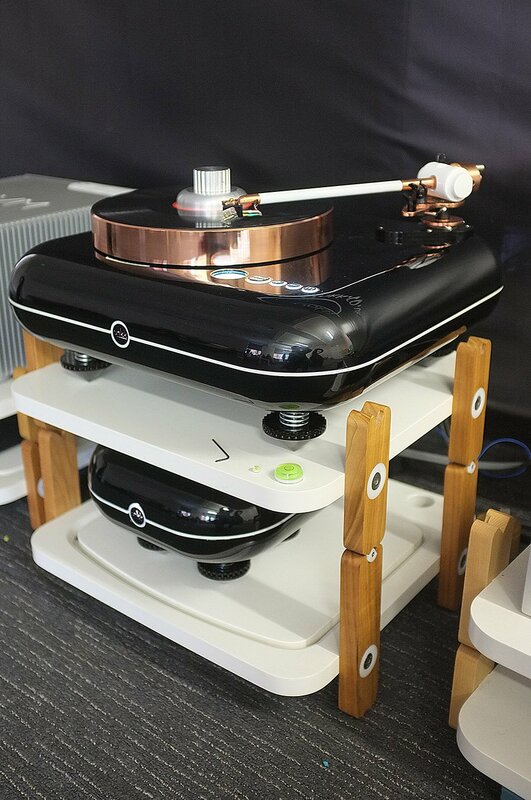 The system on show today at the National Audio Show consisted of The Planalogue Prelude turntable aith an Abis SA-1.2 tonearm and Hana SL moving coil cartridge. Phonostage for the day was a Trichord Dino along with its PSU. 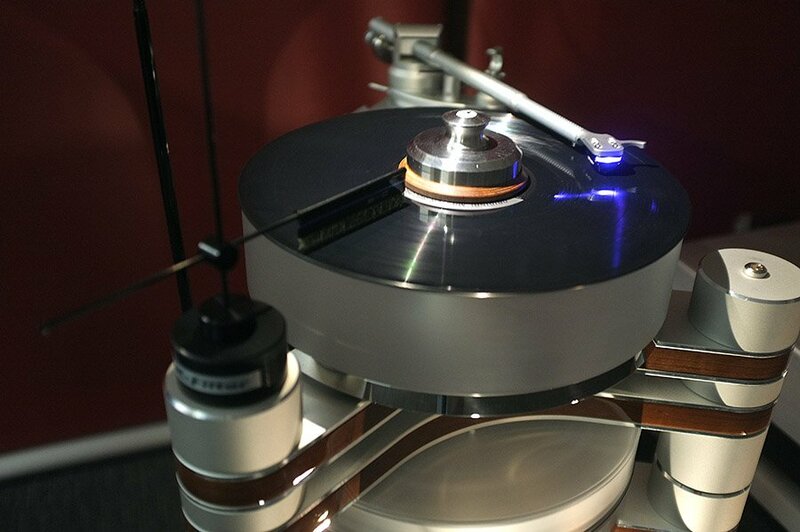 Preamplifier was a Herron Audio VT SP-3A and power amplifiers were Trichord’s Linear D monoblocks. Ludspeakers were the DSS ‘Geal”. 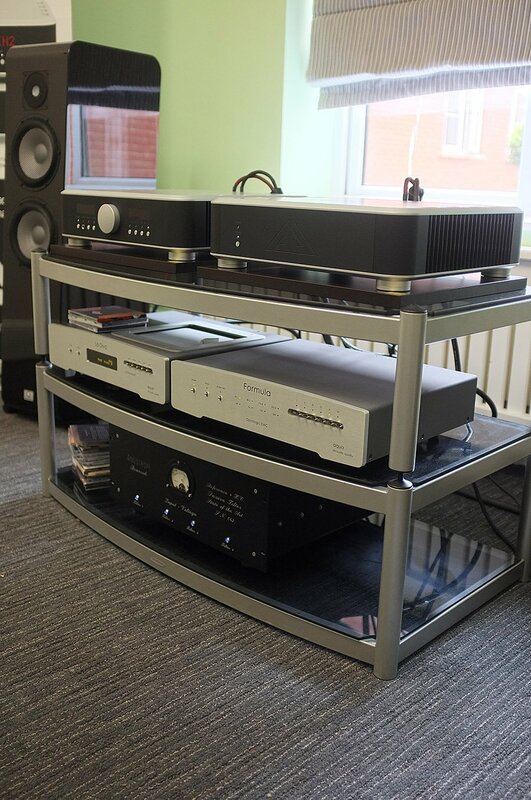 Cove Audio provided the interconnects and speaker cables whilst Power cables and distribution block were by MS HD. 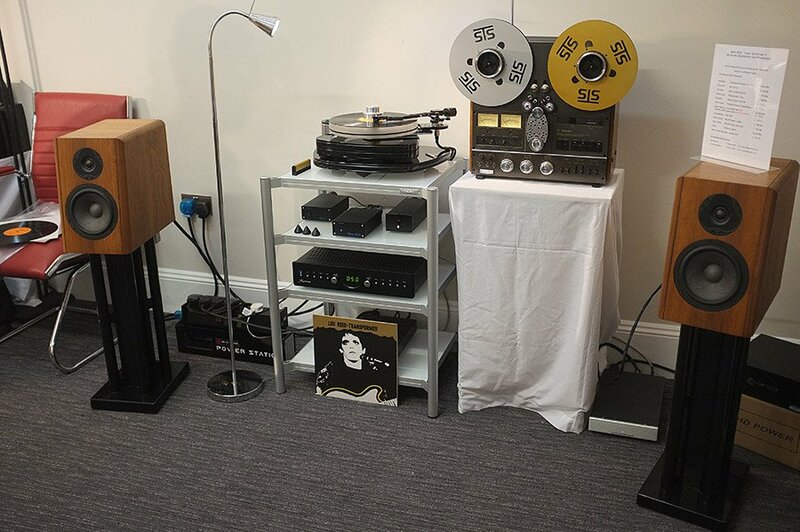 Air Audio are UK distributors for STS digital who produce great vinyl and reel to reel recordings and so, of course, there was a rather splendid reel to reel machine in evidence.